Just after 9:00 am today an SUV drove through the front doors of a Camp Springs convenience store causing considerable damage. 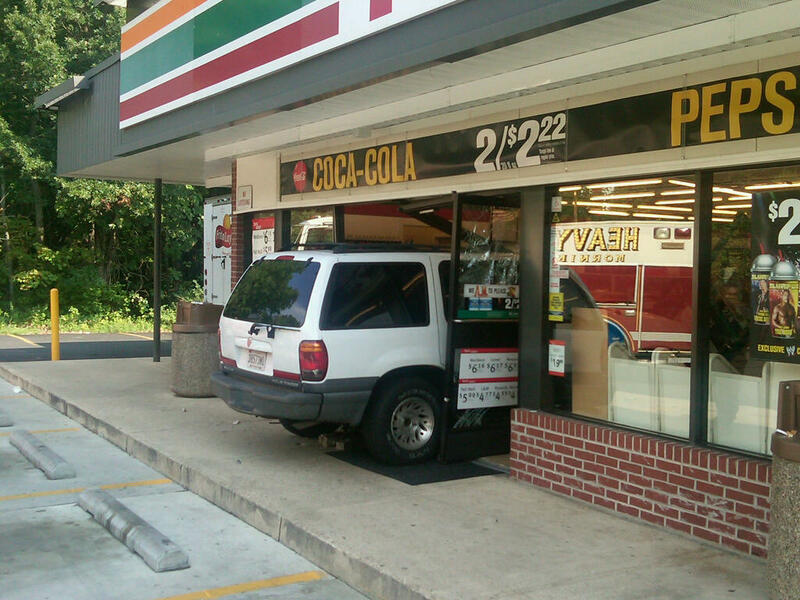 The driver believed the SUV was in "reverse"but when they pressed on the gas pedal, the SUV was actually in "drive" and surged forward through the front doors and into the counter of a 7-11 store in the 6400 block of Auth Road. Fortunately, no one was injured. A County Building Inspector will inspect the structural integrity of the store and the County Police are conducting an investigation. Photo courtesy of the Prince George's County Fire/EMS Department/Battalion Chief Keller. At around 12:30 am, Friday, August 19, 2011, Firefighters from Beltsville and surrounding stations were alerted to a report of a house fire. Firefighters arrived at the intersection of Harford Avenue and Queen Anne Avenue and encountered a large 2-story house, under construction, with heavy fire showing. Incident commanders immediately issued orders instructing firefighters that this was to be an “exterior” operation whereas the fire would be controlled from the safety of exterior hose lines and master stream devices. One firefighter sustained a minor burn when a flying ember made contact with him. He was treated and released from an area burn unit. Nearly 45 firefighters and paramedics were on the scene of this incident which required just over an hour to extinguish. The Fire/EMS Department Office of the Fire Marshal dispatched Investigators to the scene to search for the cause and origin. The fire remains under investigation and fire loss is estimated at $150,000.